The first thing I noticed when pulling the Eastern Bikes Pusher balance bike out of its box was how insanely light the frame was. I was fairly sure–based on feeling only–that this was the lightest balance bike I had ever picked up, and further research confirmed that it was. At a feather-light 4.6 pounds, the Pusher is ideally suited to young toddlers and particularly petite children. Eastern Bikes is well known in the BMX community for their innovative designs, but the Pusher is the company’s first foray into the balance bike market. Grom moms, get out your wallets. From the lightweight build to the bright paint job and “BMX” emblems, toddlers will love this little bike that looks just like one that big brother would ride. 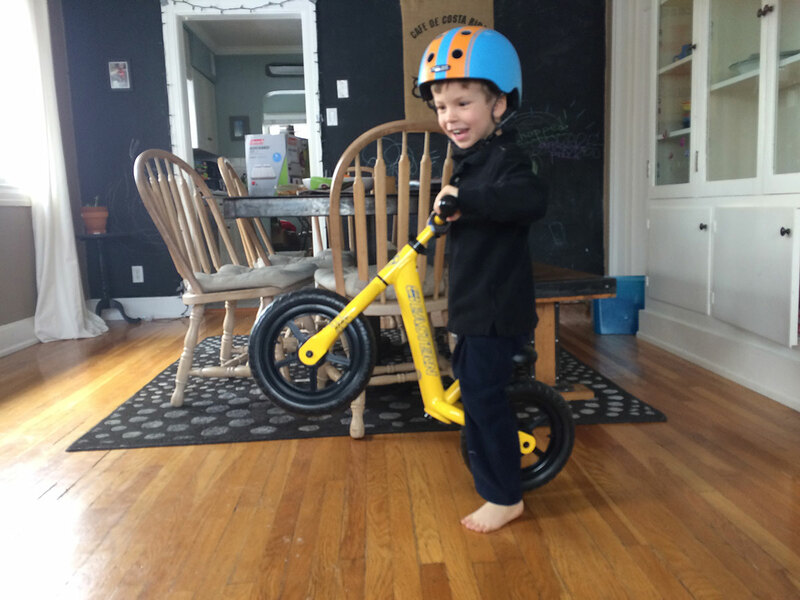 The Eastern Bikes Pusher is the lightest balance bike I’ve ever had the pleasure of testing. At 4.6 pounds, it is significantly lighter than the Strider balance bike (6.7 pounds). A lower weight bike is easier for young toddlers to learn on, and more enjoyable for kids of any age to maneuver. Both my son and his neighbor friends have had fun using the Pusher as a “trick” bike. Much of the Pusher’s low weight is attributable to the all-aluminum frame, handlebar, and seat post. That said, some of the bike’s weight advantage is due to its lack of additional features found on other higher-end balance bikes—such as a handbrake and pneumatic air tires. As with all things, this is a trade-off, but it does make the Pusher a better option for younger toddlers than for older ones. I always cringe when I see kids’ bikes with large, exposed axle bolts. While we’ve never actually had an accident where they caused a problem in our many, many hours of bike testing, they still worry me a bit. They’re also unattractive. Therefore, I was really happy and surprised to see the buttonhead bolts on the Pusher. They look nice, and won’t scratch or otherwise injure your little one in the event of a crash. Whether to buy a balance bike with EVA tires or pneumatic (air) tires is largely a point of personal preference. The benefit of EVA tires is that they never go flat and there is no maintenance required. They are also ideal for riding in the house (if you’re okay with that kind of thing). 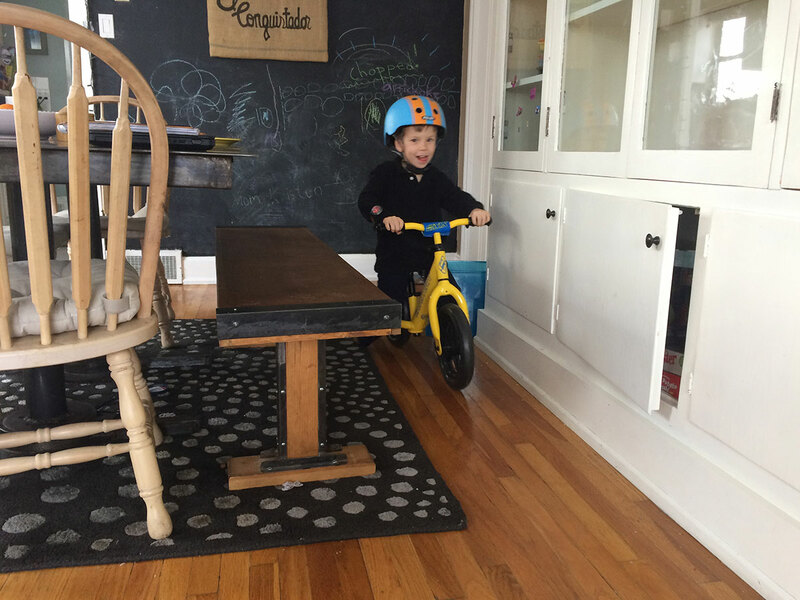 We have had a heavy snow year, and the Eastern Bikes pusher has become a favorite for racing in the dining room. We have hardwood floors and the foam tires don’t scratch up or mark them. The downside of EVA tires is that they have less traction and cushion than traditional pneumatic (air) tires. The EVA tires on the Pusher are particularly firm and have little tread. The Pusher’s EVA tires will work just fine on an indoor BMX track or indoor bike park. That said, if you’re child plans to ride outdoors on dirt, gravel, or grass, I’d caution against these tires. They just aren’t made for aggressive riding on outdoor surfaces, particularly for older, hard-hitting kids. 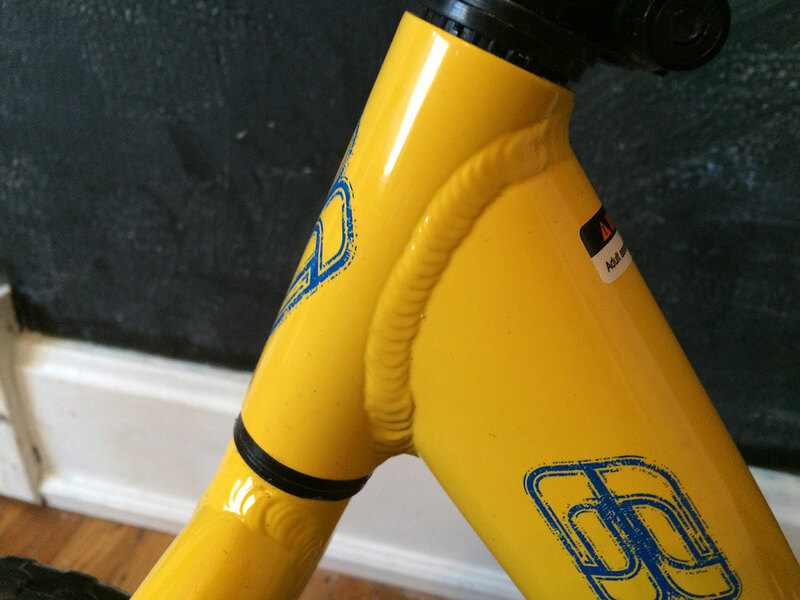 My husband is a bit of a bike snob, and a bike’s frame welds are one of the first things he always looks at. He approves of the Pusher’s clean welds on its aluminum frame. While this doesn’t affect the functionality of the bike, it is a sign of good quality and strength. Thank god for quick releases on balance bikes! Kids at this age grow so quickly (seemingly from one day to the next) that parents constantly have to raise the seat. The Pusher not only has a quick release on the seat post, it also has one on the handlebar allowing the position to easily raise as your child grows. Quick releases also allow the bike to easily be shared between two siblings or friends of different sizes. The hubs on both wheels have sealed bearings which protect them from dirt, grime, and graham cracker crumbs. This means that the wheels will keep rolling fast for a long time. This is yet another indication of the durability and quality of the Pusher. When buying a balance bike, your first consideration needs to be your child’s inseam length. The minimum seat height on the Pusher is 10.75″ which means that your child’s inseam needs to be AT LEAST this long so that they can put their feet flat on the ground. Most 18 month old’s will be okay on the Pusher, and kids in 2T and 3T pants will be very comfortable. My petite 4 year old was comfortable on the bike, but our 5 year old testers were too tall. It is easy to sing praises to the Eastern Bikes Pusher, but how does it stack up against other options? In the chart below, I compare the Pusher to the Stampede Charger 12 and the Strider Sport 12. While the Strider is arguably the most popular balance bike in the BMX racing world, the Eastern Bikes Pusher gives it a run for its money. Both the Charger and the Strider are significantly heavier than the Pusher–this is the category in which it clearly shines. That said, the Pusher is also $10 more expensive. To compare the Pusher to even more options, check out our balance bike comparison chart. 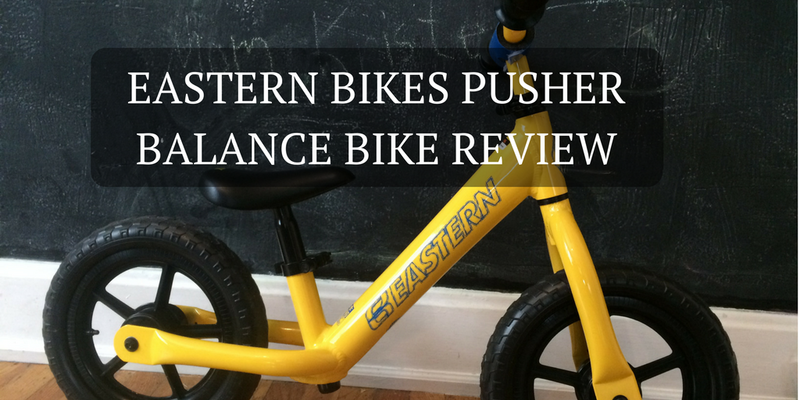 For the BMX-oriented grom moms and dads, the Eastern Bikes Pusher balance bike is a top pick. 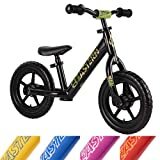 It is ideally suited for young toddlers (18 months and up) and for kids who plan to ride at an indoor track or bike park. At a mere 4.6 pounds, you are unlikely to find a lighter or easier to maneuver balance bike for your kiddo.